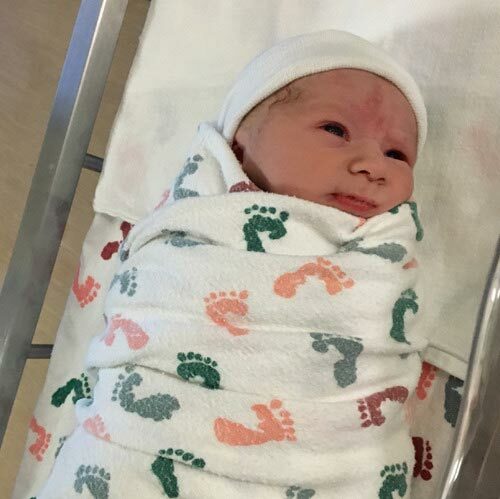 Just when I thought I had been through it all… Enter Levi. It’s currently 2 in the morning and I’m sitting in my kitchen with a freshly brewed cup of coffee. I must have a newborn! I feel like this particular post is going to take a long time to write because I’m using an iPad with the tiniest little Bluetooth keyboard ever built. My hands are so close together it’s like trying to type while playing “here’s the church, here’s the steeple”. Screw it, I’ll just use the stupid virtual keyboard. The struggle is real, people. Anyway, let’s just start from the beginning - It was Thursday and Rachael was incredibly uncomfortable. She had a checkup on Wednesday following a night of cramping and was found to be at 3cm. Ah Yes, the joys cervix circumferences again! As I’ve lamented many times before, the mention of that word still makes me want to self-lobotomize. It’s like nails on a chalkboard - if that chalkboard was located directly behind my sphincter. You know that feeling you get when you’re listening to somebody talk about losing a limb and you immediately start grabbing your own limbs just to make sure they’re all in tact? This is the same thing, except I have no cervix so I’m forced to improvise. Hence, sphincter. Why am I telling you this. I’m sorry. The baby had technically dropped but apparently there was still some room for him to drop more, and sadly 3cm + not fully dropped = no hospital admittance. It sucked, we had hoped she’d be further along. Granted we were still 12 days before the due date, but ever since the baby dropped, Rach had felt a TON of pressure in her backside and a lot of pain in various other areas. She was miserable. Later that evening we were at my parents and she began having actual contractions so we rushed home to get everything ready because as far as we were concerned it was ON. Rach went to bed and I got ready to make a pot of coffee in preparation for an all-night baby-extracting extravaganza! … Then the contractions stopped happening. Luckily Rach informed me of this before I made the coffee because she would have killed me if I had wasted a pot of her precious brown nectar. Thursday arrived and still nothing, but the pain and pressure had intensified. To our knowledge, she had to be at least 8cm because the contractions from the night before were INTENSE, however the contractions were all but nonexistent now. Everything just seemed odd. At this point I had told Rachael to call her freaking doctor and make sure everything was alright - it all just seemed very concerning: Lots of pain, lots of pressure, then a night of contractions which just stopped happening with no explanation at all… Why is the female body so chaotic?? Rachael almost never listens to me when I tell her to call a doctor or go to the hospital because clearly that’s just too simple a solution - and if there’s one thing pregnant women are consistent in, it’s being irrational. Whatever though, we didn’t call a doctor and she continued to feel like crap for another night. Can I just say that as a husband, when your wife is 9 months pregnant and miserable, be prepared to stand awkwardly by the bed doing nothing except making sad faces and saying “What can I do?”. That’s all we’re good for. Every time you offer to do something, she says there’s nothing you can do… But if you attempt to walk away (because nobody likes standing next to a bed frowning) she starts to moan uncomfortably as though your awkward presence is the only thing keeping her uterus from imploding. Also - don’t even attempt to rub her head, or her back, or hold her hand, or kiss her cheek, or really show any form of physical affection whatsoever because while your presence is apparently keeping her on life support, your touch is the bearer of pain and suffering. So don’t touch. Don’t talk. Don’t actually look directly at her. Stand there uncomfortably for as long as she requires you to stand there and keep frowning. Finally, when she lets you leave the room, I would suggest leaving your phone behind, because the moment you sit down, you will be texted immediately about how uncomfortable she is… And your useless presence will again be required. It’s like a Mexican stand-off except you don’t get the satisfaction of being shot at the end of it. So at this point I had finally had enough and demanded we go to the hospital - this time she obliged. 4cm. What the serious EFF. The nurse left the room and we waited for the doctor to return and banish us back to our home where nothing but a miserable existence of phantom labor pain awaited my poor, pregnant wife. It was a rough moment, but oddly enough the nurse walked back in and said she was admitting Rachael and they were going to break her water… BABY TIME!!!! I don’t know if any other dads agree, but I always feel like the nurses and doctors would rather I NOT be in the room. When you’re the father, nobody acknowledges your existence unless you’re in the way. If I stand too close to the bed I’m blocking something the nurse needs to get to. If I stand too far away from the bed, I look like I’m not being attentive to my wife… and also I’m still blocking something the nurse needs to get to. Being a dad in a hospital is the ultimate third-wheel experience. Let’s skip to water breaking. Everybody loves a good water break. They gave Rachael the epidural - which was absolutely horrifying because Rachael was fighting through a really bad cough. I don’t know if this was a life-threatening situation or not, but I can’t imagine a worse time to have a needle in your spinal cord than while suffering the sporadic condition of wildly convulsing until the tickle in your throat is gone. I’m happy to report that she didn’t cough and become paralyzed. So now the fun begins. Once Rachael’s water was broken, we focused on two wavy lines on the monitor. The top one was the baby’s heartbeat - it was blue. The bottom one monitored Rachael’s contractions - it was purple. I never pay attention to these things because I trust the doctors to understand them and relay to me any important information. What concerns me is when the nurse is intently staring at the monitor like she’s watching a murder happen and is constantly having Rachael switch positions on the bed. I get more concerned when I ask “Is everything okay?” and I have to wait 30 seconds to get a dang answer (it’s the same way with my boys, I always know they’re lying when they don’t answer me right away). So we both asked what was going on, and the nurse finally pointed out that with every contraction the baby’s heartbeat would drop. Supposedly this is normal, but the way the nurses were acting made me think something was definitely not normal. But we carried on. I’m real good at reading the monitor now - I’ve stared at it without blinking for at least a half an hour. Like clockwork the contraction goes up and the heart rate goes way down. The heart rate wasn’t even related to how big the contractions were. Small ones caused the heartbeat to drop just as much as the large ones did. At this point I was convinced that if Rachael were to fart the baby would just flatline. Rachael was becoming increasingly nervous, but fortunately she was facing away from the monitor so I could do my best to lie to her about what was going on. I’m a horrible liar. She at one point asked me if everything was okay (we seemed to be asking this a lot that day), and as I was saying “everything is fine” the heartbeat dropped WAY WAY WAY low and I dragged the word “fine” on for about 3 or 4 seconds like I was having a stroke. So we prayed. There’s not much else you can do in those moments, just pray. The nurses were getting more and more distant, the heart rate wasn’t changing and we were a nervous wreck because we were getting no information and clearly something was wrong despite the fact we were constantly being told everything was normal and fine. Rachael finally made me ask if we should just do a C-Section. Or maybe she asked? I can’t remember. Somebody asked and the nurse replied with a big fat “Not sure yet”, then walked out of the room. Comforting. But before Rachael and I could even really say anything to each other, the doctor came in with her nurse posse and declared “We have to do a C-Section right now.” They suspected the umbilical cord was wrapped around the baby’s neck, so without any hesitation, they rolled her off and threw a pair of scrubs at me as the door closed. This moment is burned in my memory forever. I barely had a chance to tell Rachael that everything was going to be okay before they wheeled her away. I remember the look on her face, I remember the panic of knowing something is wrong with your baby… and then I remember just being alone in the room. At least I wasn’t in the way anymore. A few seconds later another nurse walked in and told me to get the scrubs on and if they didn’t have to put Rachael under, they’d bring me in for the procedure, otherwise I’d have to wait it out until it was done. I asked if everything was going to be okay and she replied that everything would be fine… I don’t even know why I asked, they said it was ‘fine’ every time and as it turned out, literally nothing was fine. I threw the scrubs on (luckily they informed me the scrubs go OVER the clothes, crisis averted) and I did what I was told: I waited. In moments of panic, the best solution is to just focus on what you need to do. The only problem was that there was nothing I could do. So I began frantically texting my parents about what was going on. Word of advice - DON’T DO THIS. The knowledge of what was going on was bad enough, but to actually write it out and read it back to myself was horrifying. So the tears start building up. I’ve officially been left alone with my thoughts for too long and with no distractions, and now I’m a neurotic mess. I hold it back though, knowing if I get called into that room I’d need to keep it together for Rachael. But then my mom called. If you’re on the verge of crying, don’t answer the phone when your mom calls. Awesome. Mom was crying, now I was crying, it was just a mess. So I hurry her off the phone because good lord, SOMEBODY needs to keep it the eff together and I start doing the routine - pacing, praying and panicing. For real, how long does it take to figure out if you’re going with anesthesia or numbness?? Enter nurse. I’m scrubbed up and ready to go… And then she tells me they put Rach under and I can’t go back. Fan-freaking-tastic. My heart sunk. My baby is being surgically removed from my unconscious wife and I’m standing in this room looking like a douche with a stupid pair of scrubs over my clothes trying not to freak out instead of being present for the birth of my child. As she explained the situation, I just looked down, attempting to pay attention but failing miserably because I was just doing my best to keep anymore tears from smudging my glasses. I don’t even remember what I said to her - I probably just asked if I could take the dang scrubs off now. There was literally no point in asking if anybody involved was okay because the answer was always “Yes, fine” regardless of how truthful that response was. Hey, here’s a thought, lady - LEAD WITH THAT NEXT TIME! As I’ve made very clear at this point, I’m a man who cries, but I cry when it hurts. 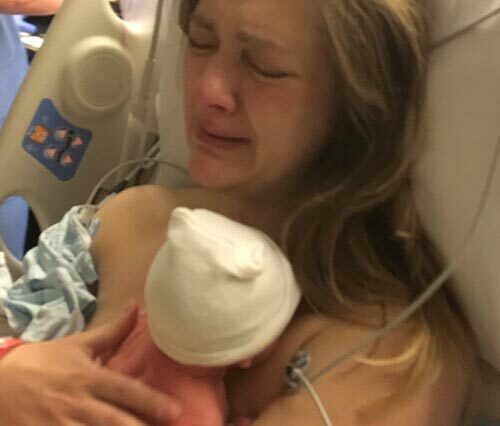 A joyful tear had never left my face until that moment, and the mention of my baby boy being okay was enough to not only shatter the floodgates, but also shatter the record for world’s ugliest cry… I ugly-cried hard. It was disgusting. I don’t even know what the nurse said after that, I didn’t care. At this point all I could think about was ripping my scrubs off like Hulk Hogan and kicking down the surgery doors to get my baby. But I refrained. The nurses left, and I again sat there and waited, trying to text my family through the tears that everything was alright. As it had turned out, the doctor was right and the cord was indeed wrapped around his neck. They made a good call. The next 10-15 minutes is a little hazy at this point. I know I called my brother to tell him everything that had just happened, but outside of that it’s all a blur. Right up until a nurse called me out of the room so I could finally see my third son for the first time. I almost knocked the doors over running out into the hallway just in time to see a nurse wheeling the bassinet up to me. I wasn’t even nervous, I knew he’d be beautiful - honestly, for all the trouble he put me through, he could have looked like a slug wrapped in bacon and he still would have been the most beautiful thing I’d ever laid eyes on because he was alive and he was with me. … I’m happy to report he was the regular kind of beautiful though. So on Friday, February 2nd, 2018 at 5:58pm, Levi Christopher Marianelli took his first insanely stressful breath into the world. I asked if I could hold him. They said I couldn’t yet because due to the c-section, he was having some trouble breathing and they wanted to get him to an incubator - I think they saw the panic building up again and quickly told me that it was perfectly normal and he was already getting better, he just needed some help until he figured it out. Or something like that - really I couldn’t focus on anything anybody was telling me because I was so bent out of shape over everything. They gave me all of his measurements and I didn’t remember a single one. It’s not my job to remember these things, it’s Rachael’s job, and she was still unconscious. Crap, I haven’t even asked about her yet. Levi had a weight, he had a length, and luckily he had a name - and it’s a miracle I even remembered that little detail. In retrospect, I had a golden opportunity to name the boy anything I wanted! There was no buzzkill wife telling me I can’t name my own son Leviathan. Fun Fact: “Leviathan” was actually the nickname we had given him after we decided on the name Levi and he began kicking Rachael’s fragile ribcage into oblivion every night. Despite the fact I couldn’t remember his actual weight, I do know he’s the lightest baby we’ve had yet, and I’m okay with this. Noli’s a big boy and my arms can take no more. I kid, I kid… Ish. So I handed my son back over to the nurses, they placed him in the incubator and I followed another nameless nurse to see my wife… Only he didn’t take me to see my wife. He took me to the main desk to pay my stupid hospital bill. I should have been infuriated, but I applauded their tenacity and began to sign a whole mess of stuff without actually reading the fine print. It’s possible I sold Milo into scientific research and experimentation… He’ll be fine, I’m sure. They brought me back to our room and told me Rach was awake and they’d be bringing her in shortly. Alone again. I sent the 8,000 pictures I took of Levi out to my family and stared at my phone as I received about a hundred “awwww” texts accompanied by a vast assortment of emojis and gifs. Then, like a dummy, I posted Levi’s picture to Facebook and announced him to every busybody I’ve ever known. … Then I remembered that Rachael hadn’t even seen Levi yet and I had just sent his picture to every human being on the internet. This is why dads should NEVER be the only conscious people after a birth. Finally, in rolled Rachael - a hot mess from the anesthesia. The poor girl was having a really rough time. She had told me later on that the last thing she remembered while being put under was having trouble breathing. So she went under thinking the baby was in danger and that she was about to suffocate… I’d say that’s a good enough reason to wake up freaking out. She was really upset, I felt horrible for her. She’d just gone through a really rough time and all she could do was beg to find out what happened to her baby. I quickly ran over to her and began telling her Levi was okay and that he was beautiful. She responded to it and sounded relieved, but would just start freaking out again seconds later and I’d have to keep reassuring her everything was okay. She’s always had a hard time coming off of anesthesia, it normally results in crying fits. Eventually she began to calm down some, and it was just in time for Levi to come into the room. They brought him in and immediately put him in her arms. 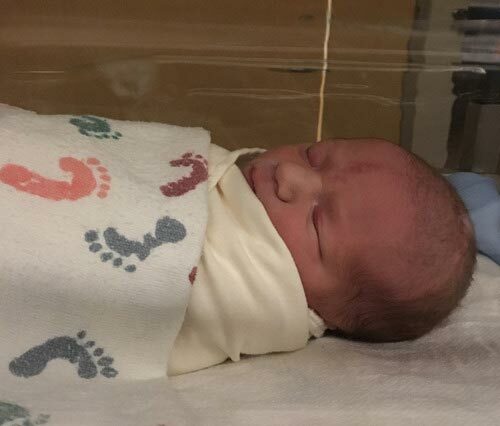 Rachael broke down crying as she held her baby boy for the first time and I started getting teary-eyed again (I need to watch some Schwarzenegger ASAP to replenish my man-supply… Wow that sounds dirty). I held it back this time though, just doing my best to take in the moment. I know I’ve said it about every birth we’ve had now, but it was one of the most beautiful sights I’d ever seen. Rachael finally had her baby and he was healthy, safe and sound. The girl hardly had any strength in her arms and she was covered in wires and IV’s, but holy crap did she keep a grip on that little boy. Moms are great. It took 40 minutes in total from the time they rolled her away to the time she was reunited with her little Leviathan. Pretty impressive, though it felt like I had been waiting in that room by myself for a month. We always wanted an afternoon baby (thinking we’d be rested enough to enjoy him without being physically exhausted by a 3am birth), well we finally got our wish and it made zero difference whatsoever thanks to the most stressful 40 minutes of our lives. Leviathan was an appropriate title after all. Per usual, there’s a part II coming, but we’ll see how long that takes me to write… I’ve got 3 kids now.